A standout story from one James S.A. Corey – an author unknown to me, sitting amidst some very big names in this volume. It’s a standout story and the more you read on here the more it will detract from your reading the story, and I would recommend you buy the anthology to read it, it’s pretty much worth the cover price on its own. Without giving away too much, it’s a well constructed story, the narrative accelerating as the pilot of a spaceship reflects on how he got to the point where he is now and where he’s going to. This involves a touching love story, of Mars Colony-Earth politics and conflicts. The conversation amongst friends rings true, and all in all its got a depth of feeling that you rarely get in most SF. It transpires, from a read of the author bio, that the one James S.A. Corey, an author unknown to me, is in fact the two authors Daniel Abraham and Ty Franck. Now, Abraham is known to me, most memorably from his work finishing off (if I remember correctly) the three-way story ‘Shadow Twin’ with Gardner Dozois, George R.R. Martin, which was a standout story in the early days of online sf on SCI FICTION (and expanded into the novel ‘Hunter’s Run’. Danged if I can find my review of that story from the days when I was hand-tooling reviews in html. Ty Franck I do not know from Adam. 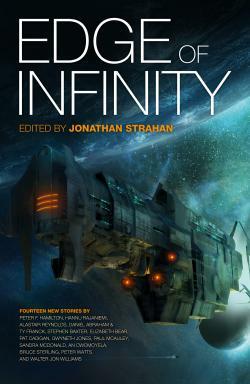 Their novel ‘Leviathan Wakes’ is set in an Earth/Mars/Asteroid Belt, and if that novel, which has been well-received, is half as good as this story, it will be exactly 2.7 times better than about three quarters of published sf. You do the math.